Tortuga's stain-resistant synthetic wicker is regularly subjected to accelerated weather testing. The superior wicker quality is achieved by the inclusion of Chemissorb and Tinuvin U-V Stabilizers manufactured by CIBA-GEIGY. The 3-YEAR WARRANTY covers the synthetic wicker strands against: cracking, splitting and unraveling under normal usage conditions. The Maracay Rocking Chair A unique and stylish oversized rocking chair, the Maracay Rocking Chair features a 22.5" inside width. 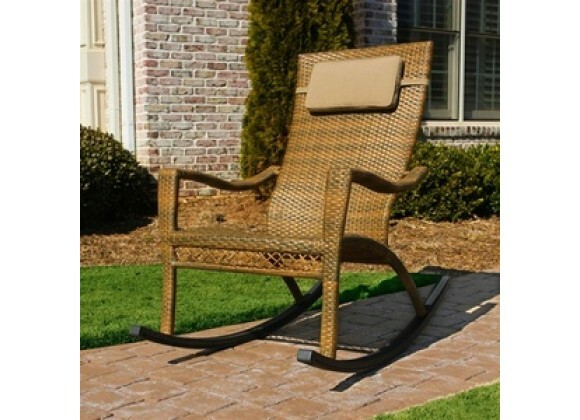 Perfect for a porch or patio, set a collection of these rockers out to watch the sunset or enjoy a spring breeze. 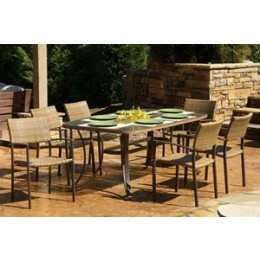 All-weather wicker - unlike natural wicker; our all weather wicker is stain; water; uv; crack and split resistant. Double wicker weave for added comfort and durability. Powder coated aluminum frames are light weight and will not rust. Dimensions (inches) : Overall: 46"L x 29.5"W x 43"H Inside arm width: 22.5" Seat depth (front to back): 20.5" Seat Height: 18"